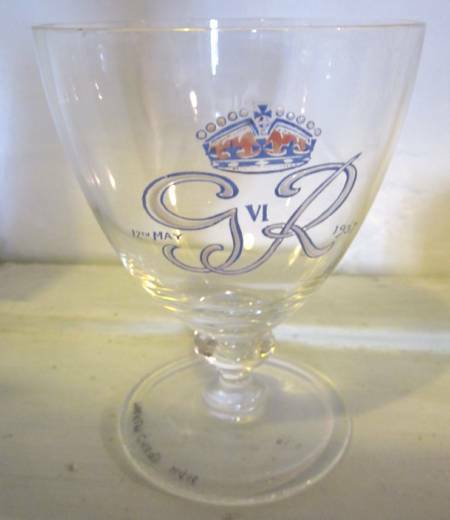 No doubt many an item was produced for people to buy, to remember the coronation of King George VI back in 1937. We featured a handkerchief last year and you can re-read that page by clicking here. Today we feature two more items that may well have found there way to many a home. The first is a recording of the coronation service at Westminster Abbey. Actually, this is probably one record from a huge boxed set for it appears to be number 28. 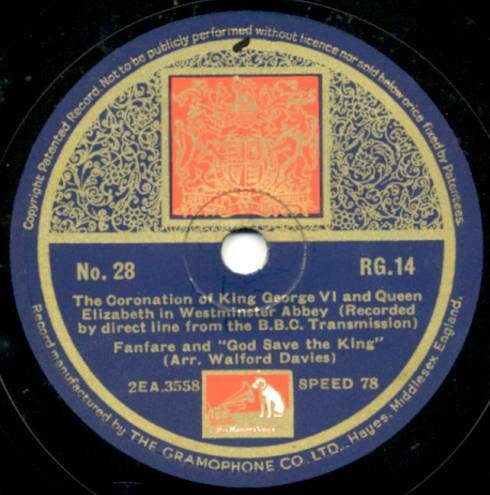 Back in 1937, we were still in the days of the old, brittle 78-rpm records. About 5 minutes was the absolute maximum play time per side of record. How things have changed! This record belonged to a Northbrook resident. Our other item is a very elegant glass. This item will be on display, in the museum, for our 2012, ‘Royal’ season. It once formed part of the décor of Clyffe Hall when it was a hotel. This entry was posted on March 30, 2012 at 5:26 am and is filed under Museum. You can follow any responses to this entry through the RSS 2.0 feed. You can leave a response, or trackback from your own site. I have one 78 disc of the HMV coronation service set.” Zadok the Priest” anthem, followed by the annointing. Is this of interest or value? Sorry Colin. It’s of no interest or value to us unless it has Parish of Market Lavington connections. We have no dealings in value. I have no idea aat all if your item has any.